Three psalms : for SATB choir & organ / Andrew Batterham. 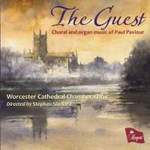 Score: Lord I have given up my pride : Psalm 131 / set by Andrew Batterham. Score: Save Me O God : Psalm 70 / set by Andrew Batterham.